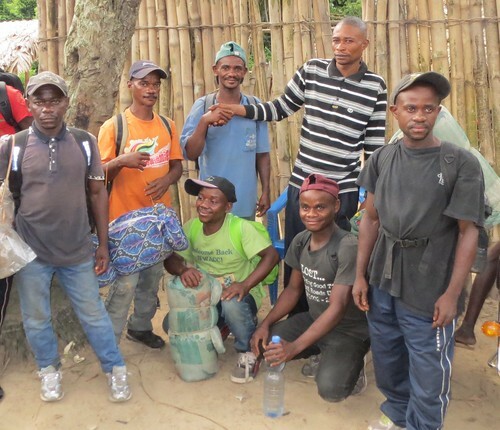 Searching for Bonobo in Congo » Mbuti Exodus: from Lualaba Barge to Lomami Forest Canopy. 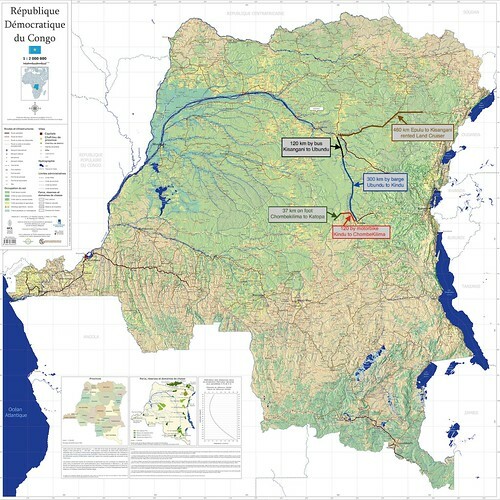 Kisangani to Kindu (13 February– 23 February 2015): The Mbuti travelled for more than a week up the Lualaba River (upper Congo). 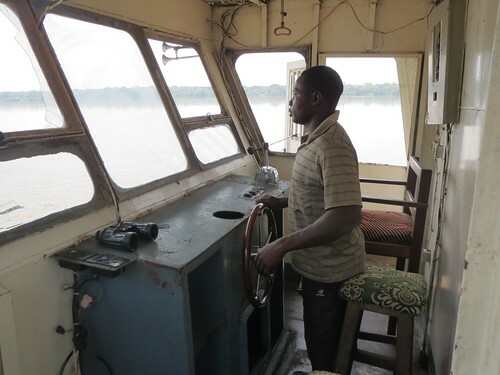 After taking a bus overland to Ubundu, the Mbuti moved upriver for more than a week on a Congo River barge. 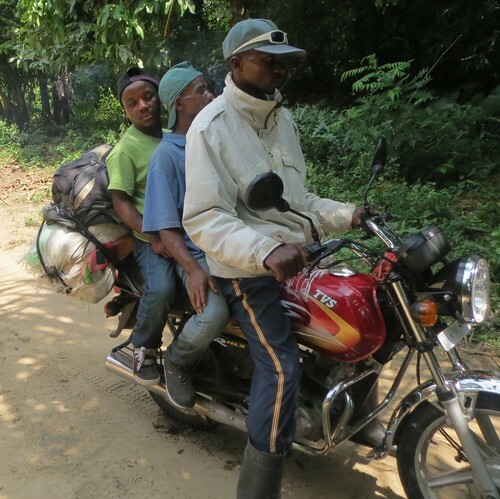 Their exodus from the Ituri included landcruiser, bus, barge, motorbike and finally a long hike. They logged over 1000 km. 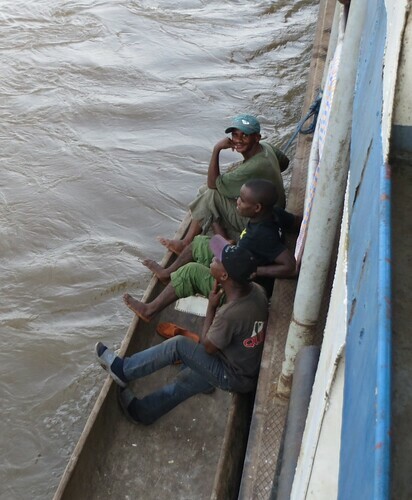 On the Lualaba, from the “life-dugout” they watched the River go by…. …and its own peoples as entertwined with the river as the Mbuti are with the forest. Arrived in Kindu, spirits were high at our TL2 guesthouse. Mateso continued his role as cook, here fanning the flames of the charcoal babula. Dino (who has accompanied the Mbuti from the Ituri) and Nobirabo (who remains in the Ituri) organized phone calls with wives and loved ones before leaving Kindu for Katopa camp. This was the first time on the telephone. Ueli speaks to his wife. 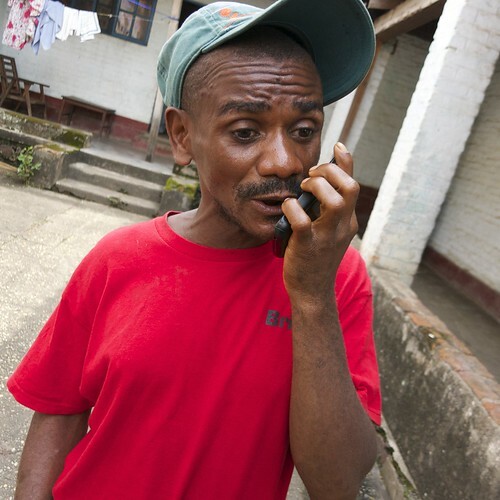 Mbeya was informed that his wife gave birth … he is father to a son. A special celebration for the new father. Aside: Unfortunately a month later out in camp Mbeya is diagnosed with tertiary syphilis. He is treated, but his wife must be treated and the new baby checked. Mbeya at camp Katopa after receiving one in the series of shots. 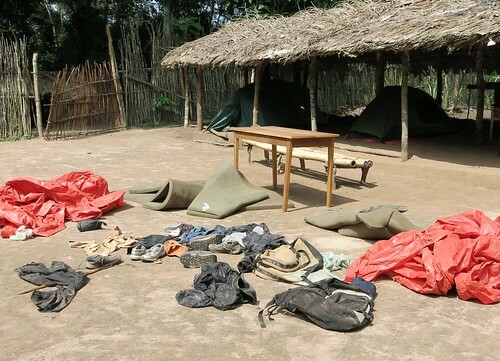 From Kindu to Katopa camp (26 February to 28 February 2015): the Ituri team must cross the Bangengele villages all the way to the last one, Chombe Kilima. 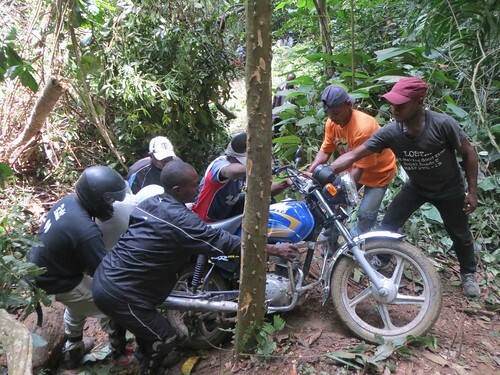 Pushing – pulling the motorbike around a fallen tree. They were welcomed by the Bangengele and the village of Chombe Kilima. The chief wishes them well. 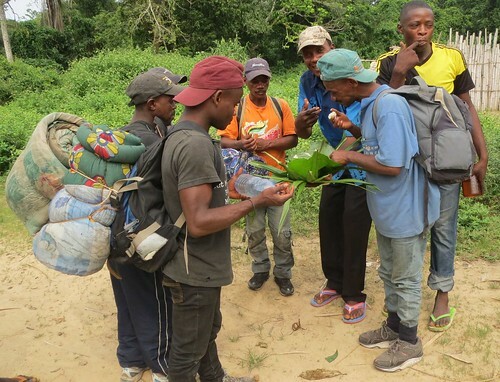 They are given the local manioc paste – lomata – to give them strength for the walk. Then they must cross forest and savanna, 37 km, through the park to our base camp Katopa on the other side of the Lomami River. Dino accompanied them on this, the last leg of the trip to Katopa camp; then Dino returned to Kisangani. Dino leads across the savanna under a punishing sun. Forest work got underway only slowly until the botanical team gathered (next post). 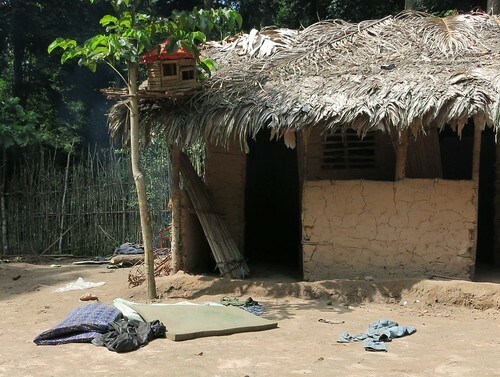 Unfortunately, camp Katopa is right next to the village of Katopa. 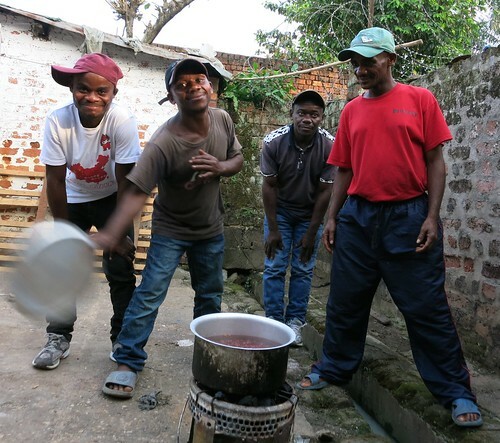 In the village many of the Mamas distill Kindingi, a local brew, made from corn and manioc. The Mbuti had some money and no other plans than a good time now. There were no wives or family to direct the good time. Unfortunately their good time kept the whole camp awake. My first night in camp, Mateso carried on with a drunken dialogue through the hyrax night calls and the blue monkey’s morning calls…most of the rest of the Ituri team slept it off. 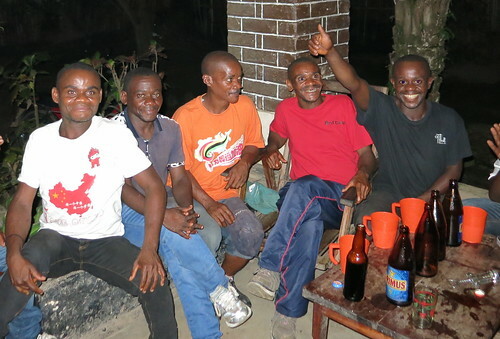 But several nights later, after the botanical team was present in full force and after receiving their first pay, the drunk was so bad NO ONE slept and in the morning the Ituri team’s part of the camp was gutted. Tired, discouraged the botanical team marched off with all the Mbuti, except for Mbeya who was receiving penicillin at Katopa. 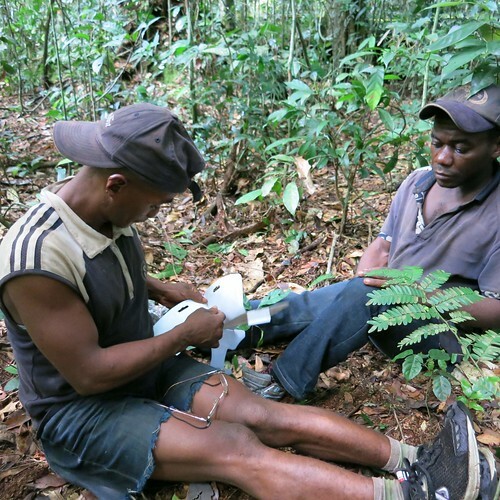 From Katopa camp to forest camps (March, April, May): The botanists were set for a first eight-day spell of plot inventory where the Mbuti would dry out with plenty of time in the forest canopy. A zoom-in on Emula high in the canopy. Paul throwing leaves down to the botanists below. The work was enthusiastic – impeccable—and spirits as tall as the trees that were climbed. The botanical team of university students is lead by Professor Ewango. 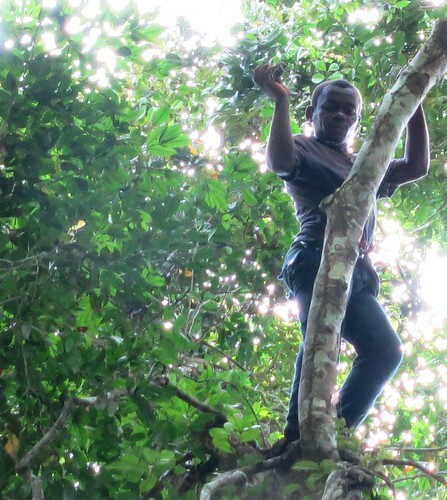 Both University students and Ituri Mbuti are learning the trees of the Lomami. 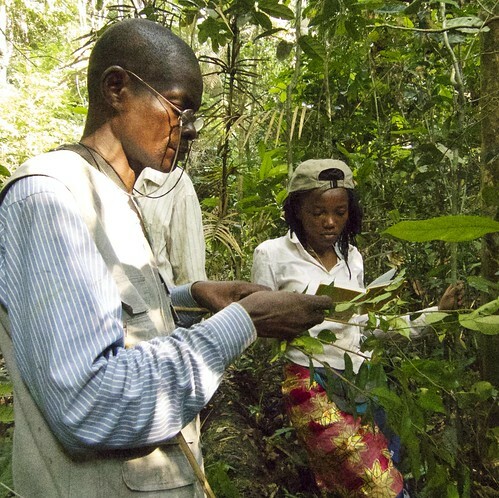 Prof Ewango examining leaves. The student, Modestine, taking notes. 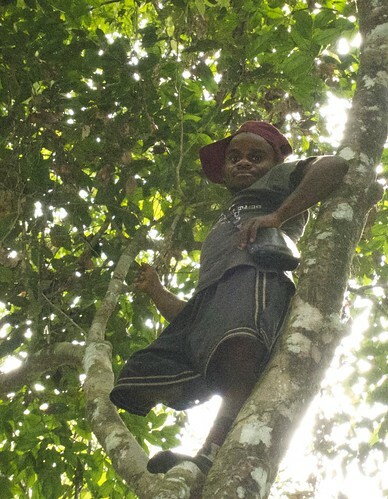 Ewango insists on having leaf evidence for any tree that cannot be confidently identified. This is where the Mbuti are irreplaceable. We are identifying mainly plants that have neither flowers nor fruits; it is absolutely essential to have the leaves no matter how high the tree is. Using a liane to rope in a distant tree on high. But that is not their only contribution. Where ingenuity is needed in the face of minimum outside inputs – they are the engineers. Corneille needs reading glasses to read the calipers. Climbing to get a diameter above the buttresses he leaned into a tree and broke his glasses. 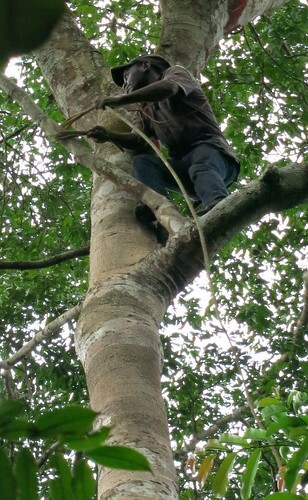 Prof Ewango climbing up to help Sumaili take a diameter reading. Repair of Prof’s specs happened right there on the forest floor. Soumaili found some gluey substance left on the commercial packaging of one of our meter tapes. 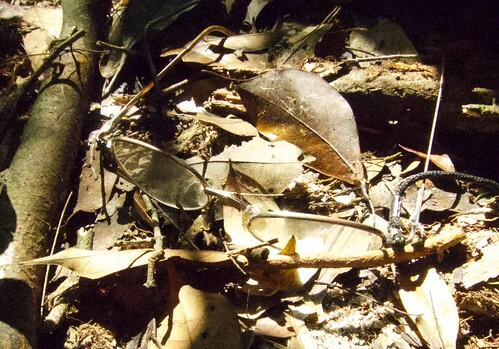 After patching, he set the spectacles to dry in a sun patch on the forest floor. We are still learning how to do the vegetation inventory efficiently. A complex team is essential. 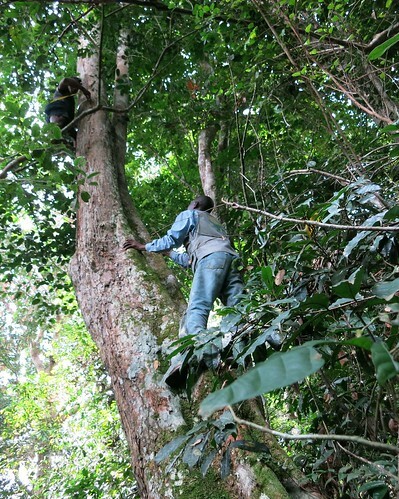 Obviously we must have botanist –taxonomists-ecologists (see next post), but equally essential are the Congolese forest experts and climbers. 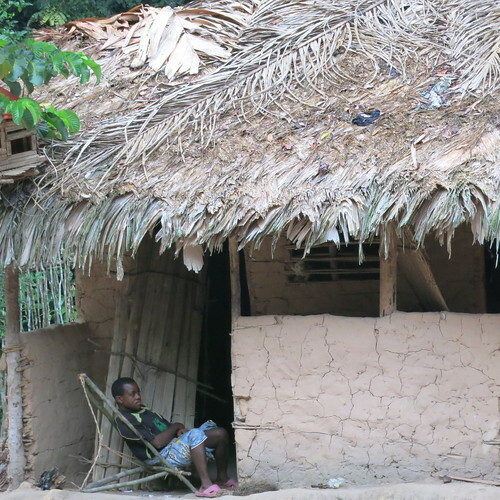 For now at least our best bet is the Ituri team as the more local pygmies are few and distant. Lesson learned: Perhaps it was a mistake to bring individual Mbuti and not whole families; so, in early June the Mbuti will return to the Ituri and those that come back to the Lomami in September will come with their families. 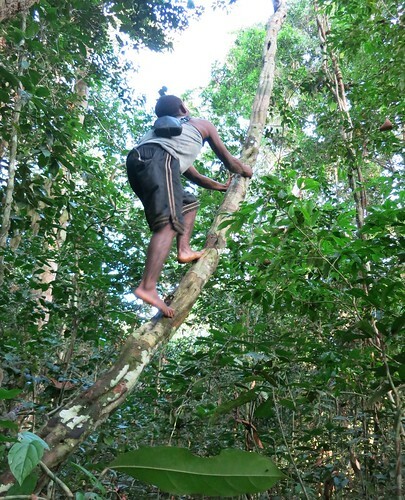 But right now – just out from eight days at Braza camp – a hectare of forest inventoried – all is positive with the botanical initiative. Perhaps there was a bit of Kindingi tonight…but it has been turned to music: drumming, singing, and a light rain on the mogobo roof of the baraza. 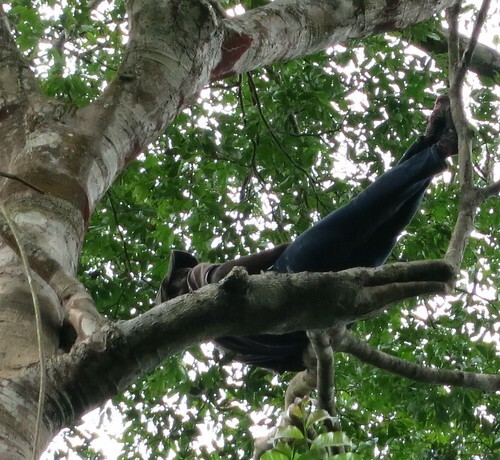 Paul takes a rest high in the Lomami Forest Canopy. This entry was written by Terese Hart, posted on 2015-04-24 at 5:45 pm, filed under Indigenous peoples, The Forest. Bookmark the permalink. Follow any comments here with the RSS feed for this post. Trackbacks are closed, but you can post a comment.